“As the disparity between rich and poor exponentially widens, and the leveraging of concentrated power is placed in the hands of fewer and fewer people, the planet confronts a laundry list of perils the scale of which is apt to leave the most stalwart activist awestruck and mute. And, more parochially, the question arises – what is a filmmaker to do? (…) If John Dewey’s assessment was correct that ‘Politics is the shadow cast on society by big business,’ then these are films seeking to pierce the murk, sparking and splaying all kinds of interesting new light” (John Gianvito, seminar catalogue). Gianvito’s films breathe with this activist approach, combined with the awareness of a true cineaste. The cinematic form of his films is extracted from the subject matter and is more than just a conventional envelope. In his masterclass, Gianvito will present several excerpts from his films and his work in the collective project FAR FROM AFGHANISTAN. He will also explore and discuss a spectrum of film aesthetics that trace the history and spirit of committed filmmaking from the past to the present. John Gianvito is a filmmaker, curator and film critic. He studied at CalArts and MIT Boston. He has also taught film production and film history at various universities. In 2001, he was appointed a Chevalier in the Order of Arts and Letters by the French Ministry of Culture. For five years, he was the programmer at the Harvard Film Archive. He served on the board of directors of the Flaherty Seminar 2009-13, where he is still a member of the advisory board. At present, he is Professor of Film at Emerson College, Boston. 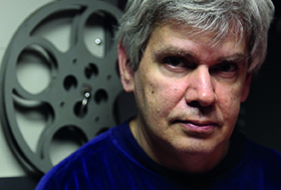 John Gianvito made his first feature film in 1983 (THE FLOWER OF PAIN), but soon turned to essay and documentary works. THE MAD SONGS OF FERNANDA HUSSEIN (2001) is an essayistic feature about the US during the Persian Gulf War. In his shortest film, PROFIT MOTIVE AND THE WHISPERING WIND (2007, 58 min), he brings the audience face to face with numerous memorial plaques that commemorate historic revolts (and massacres) and that stand for the struggle against the loss of national memory. He then worked for years on two expansive projects about the health and environmental damage caused by the US military bases in the Philippines in VAPOR TRAIL (CLARK) (2010, 264 min) and WAKE: SUBIC (2016, 277 min). FAR FROM AFGHANISTAN (2012) is a collective work in which Jon Jost, Soon-Mi Yoo, Minda Martin, Travis Wilkerson and Gianvito each realized their own take on the war in Afghanistan and its meaning for the American people.